TecRMI, the information system for automotive repair and maintenance information, supplies manuals on proper battery management for passenger cars right on time at the start of winter. This information is particularly important at this time of year because many batteries require replacement under cold temperatures. In the past it sufficed to disconnect and connect the battery terminals in the right order and the battery could almost always be found in the engine bay. 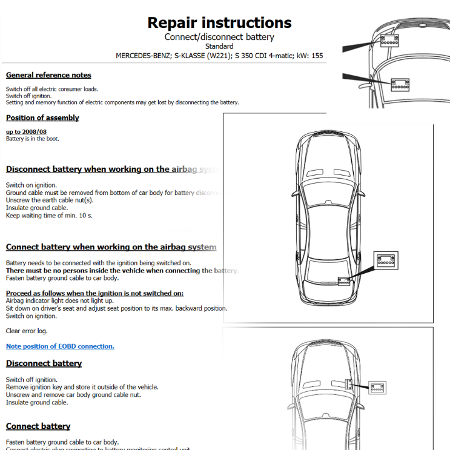 This is no longer the case with modern vehicles: disconnecting and connecting the battery can cause a loss in the settings and memory functions of electronic parts, the new battery may have to be registered, or the direct shift gearbox may have to be reset to factory settings after a battery change. The battery is no longer located in the engine bay alone but is often placed somewhere else in the vehicle. The search for a battery can take up valuable labour time. TecRMI shows the locations of batteries and supports the proper battery exchange procedures through detailed manuals. This saves time and money and prevents customer complaints. The manuals are now available for current vehicles.